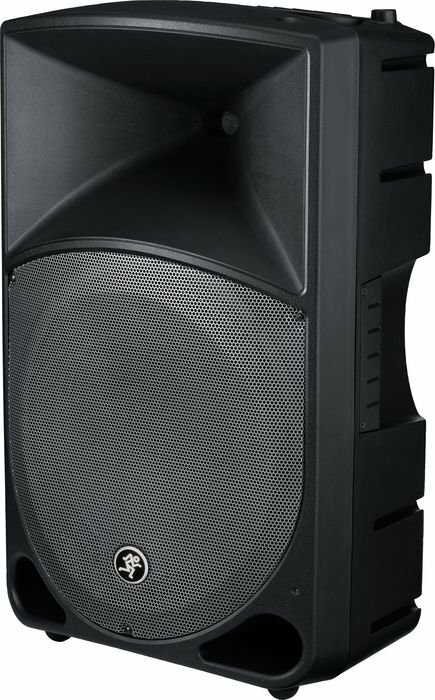 The lightweight Mackie Thump TH-15A Active Speaker delivers deep low-end and real power in an extremely portable package. Designed by the same team that produced the best-selling Mackie SRM450v2, the active TH-15A offers Class D Fast Recovery amplification that pushes 400W of power to the high-frequency compression driver and the bass-pounding 15" woofer. The TH-15A has 2 built-in power amps—300W for the 15" woofer and 100W for the high-frequency compression driver. Mackie's Class D Fast Recovery low-frequency amp drives the woofer more efficiently with less heat byproduct than other speakers. Also Mackie Active technology (based on the popular SRMv2 Series) divides the frequencies via a precision 2-way crossover and also time aligns the signals so low-frequency and high-frequency signals arrive in sync to every member of your audience. Active compression provides a first line of defense for the drivers and thermal circuitry protects the amplifiers and power supply should things get too hot. All the onboard electronic systems work together dynamically to produce superior quality sound previously unavailable in this price range. Not only is the Mackie TH-15A a superb PA enclosure, it also makes a superior monitor wedge—just lay the cabinet on its side and turn it up. The compact, lightweight design means zero strain, whether mounting it on a high pole or loading up the van. The TH-15A speaker's wide frequency response makes it ideal as a keyboard, vocal, or even bass guitar monitor. The Thump has incredibly smooth response and dispersion over a wide range of frequencies, so you can crank it without the fear of earsplitting feedback. TH-15A powered loudspeakers put out a tremendous amount of sound for their size and price tag. The two-way ported design generates ample quantities of chest-pounding bass, and its 1" compression driver ensures smooth, wide dispersion. Mackie inserted a 3-band equalizer at the input to give you all the tonal control you could ever want, with an available 15dB boost or cut at 80Hz (low shelf), 100Hz to 8kHz (sweepable mids) and 12kHz (high shelf). With the Mackie TH-15A speaker's extremely versatile EQ, you can add some extra thump to that kick drum, bring out the sizzle in your hi-hats, add pop to vocals, or correct acoustic anomalies in the room. Mackie added some extra circuitry to keep the Thump TH-15A speaker's performing at its best, even when pushed really hard for long periods of time. Each driver has its own transparent compression circuit, which helps protect them from damaging transient peaks. An over-excursion filter, inserted just before the low-frequency amplifier, protects the woofer from bottoming-out when the low end is driven to the maximum. This means you can hit them hard without fear of thermal damage. Things can get pretty hot in the real world, so if the electronics do overheat, separate thermal switches activate and shut down the high- and/or low- frequency amplifiers until they cool down. These extra protections ensure long life and great-sounding loudspeakers you can always count on. High-performance audio without the high price tag. Order today!